Also known as the Golgi complex or Golgi body, the Golgi apparatus is an organelle in eukaryotic organisms that moves molecules from the endoplasmic reticulum to their destination, and also modifies products of the endoplasmic reticulum to their final form. The Golgi apparatus is comprised of a series of flattened sacs that extend from the endoplasmic reticulum outward, into the cytoplasm. This gives the Golgi apparatus the ability to deliver vesicles, or packets of various cell products, to different locations throughout the cell. The Golgi apparatus has many discrete functions, but all are associated with moving molecules from the endoplasmic reticulum to their final destination and modifying certain products along the way. The multiple sacs of the Golgi serve as different chambers for chemical reactions. As the products of the endoplasmic reticulum move through the Golgi apparatus, they are continuously transferred into new environments, and the reactions that can take place are different. In this way, a product can be given modifications, or multiple products can be combined to form large macromolecules. The many sacs and folds of the Golgi apparatus allow for many reactions to take place at the same time, increasing the speed at which an organism can produce products. Regardless of the product, the vesicles containing the product move from the endoplasmic reticulum and into the cis face of the Golgi apparatus. In layman’s terms, this is the side facing the endoplasmic reticulum. The side furthest from the endoplasmic reticulum is known as the trans face of the Golgi apparatus, and this is where products are headed. After having any modifications or additions to their structure, the products are packaged in vesicles and tagged with markers that indicate where the vesicle needs to end up. These tags can be molecules, such as phosphate groups, or special proteins on the surface of the vesicle. Once tagged, the vesicle is excreted from the Golgi apparatus, on its way to its final destination. There are many products that are produced by eukaryotes, from proteins that can carry out chemical reactions to lipid molecules that can build new cell membranes. Some products are meant for the endoplasmic reticulum or the Golgi apparatus itself, and travel in the opposite direction of most vesicles. While the endoplasmic reticulum produces most of the products and bases used, it is the Golgi apparatus that is responsible for the final presentation and assembly of products. Often, the environment must be slightly different from that present in the endoplasmic reticulum to obtain certain end products. The many sacs of the Golgi apparatus function to provide many different areas in which reactions can take place in the most favorable of conditions. The most prevalent theory of how the Golgi apparatus forms is the cisternal maturation model which suggests that the sacs themselves tend to move from the cis face to the trans face of the Golgi apparatus over time, as new sacs are formed closest to the endoplasmic reticulum from vesicles that merge together after being released from the endoplasmic reticulum. These sacs “age” as they move towards the trans face of the Golgi apparatus, and their product becomes fully mature. Although it may seem like there could never be enough lipids to produce the continual flow of cell membrane needed to continually make transport vesicles between the endoplasmic reticulum and the Golgi apparatus, there are constantly segments of cell membrane being produced and recycled by the endoplasmic reticulum, Golgi apparatus, lysosomes, and other organelles in the cell, as well as the outer cell membrane itself. The Golgi apparatus and endoplasmic reticulum work together to produce new cell membrane, as well as recycle the cell membranes of vesicles by merging two membranes when vesicles are absorbed. One product worthy of mention are lysosomes, sacs containing digestive materials, which are pinched off from the Golgi apparatus and used to process materials which have been phagocytized or to digest organelles which no longer function. The lysosome can then deliver the raw ingredients it has created to the endoplasmic reticulum, to use the materials to create more products. In secretory cells, or cells which produce large amounts of a substance that your body needs, the Golgi apparatus will be very large. Consider the cells in your stomach that secrete acid. The acid is produced by reactions in the endoplasmic reticulum and is modified as is goes through the Golgi apparatus. Once to the trans side of the Golgi apparatus, the acid is packaged in a vesicle and sent towards the cell’s surface. As the vesicle joins with the plasma membrane, the acid is released into the stomach, so it can digest your food. Cis face – The side of the Golgi apparatus sacs closest to the endoplasmic reticulum. 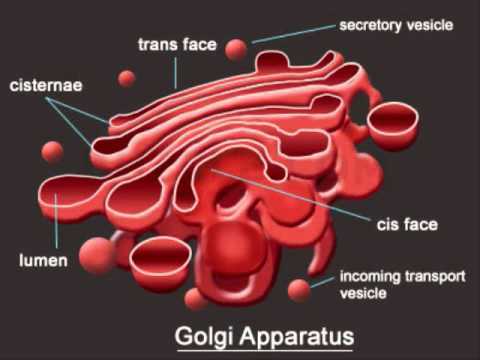 Trans face – The side of the Golgi apparatus sacs furthest from the endoplasmic reticulum. Transport Vesicle – A small sac made of cell membrane, used to transport various cellular products. Macromolecule – A large molecule formed by the combination of smaller molecules. 1. A certain macromolecule is produced when the Golgi apparatus combines 15 molecules from the endoplasmic reticulum together to form one large molecule. To make these molecules, the endoplasmic reticulum needs a lot of surface area per molecule, but the Golgi apparatus can make the macromolecule in the surface area of one small vesicle. This specific cell must produce a large amount of this macromolecule. Which of the following could you expect? A. The endoplasmic reticulum and the Golgi apparatus are the same size. B. The endoplasmic reticulum is much larger than the Golgi apparatus. C. The endoplasmic reticulum is much smaller than the Golgi apparatus. B is correct. The endoplasmic reticulum must be much larger than the Golgi apparatus, because it needs a larger surface area to produce all of the molecules needed to form the macromolecule. Because the macromolecule can be formed in a single space, the size of the Golgi will reflect the smaller need for surface area. 2. Along the same line, stomach acid cells secrete a large amount of stomach acid. Like all products, stomach acid originates in the endoplasmic reticulum. However, many reactions must take place in the Golgi apparatus for stomach acid to become strong enough to digest food. In comparison to the size of the endoplasmic reticulum, how big would you expect the Golgi apparatus to be? A is correct. In this case, the Golgi apparatus must carry out many more reactions than the endoplasmic reticulum to get the stomach acid to its final form. Because of this, there is an increased need of surface area to keep up with the amount of reactions happening in the endoplasmic reticulum. It is important to note that each cell type in an animal will have different ratios of organelles, according to their function. In this way, large, multi-celled organisms can have special organs that perform only one function for the organism as a whole. 3. A product is made that needs no further modification in the Golgi apparatus. Where does it go after leaving the endoplasmic reticulum? B is correct. Every product made by the endoplasmic reticulum must be transported through the Golgi apparatus. The endoplasmic reticulum does not tag the vesicles it produces, and therefore there is no way for the cell to know what is in them or where they are going. The Golgi apparatus, even if it doesn’t modify a product, must put that product in a vesicle with tags designating its final destination. In this way, the cell can efficiently move packages around without having to investigate the internal contents of every vesicle.